Give It Away. Give It Away. Give It Away, Now. At what point is it ok to decide that something you thought would be a perfect gift really wasn’t? Here it is, nearly 365 days after I received Cookwise for Christmas and honestly, that book is collecting some serious dust on my bookshelf. I don’t get it. I always enjoyed it when Shirley Corriher made a cameo appearance on Good Eats and I was certain that Cookwise would open a whole new understanding of food science to me. So I read it cover to cover. And none of it clicked for me. None. Nothing. Nada. I’m convinced this has nothing to do with Miss Shirley and everything to do with me. Wow, I never thought I’d use the “it’s not you it’s me” line to break up with a cookbook. So in the spirit of giving, I’d like to find a new home for Miss Shirley. One where she is appreciated and her knowledge of food science is regularly called upon. Or at least called on more than once a year. 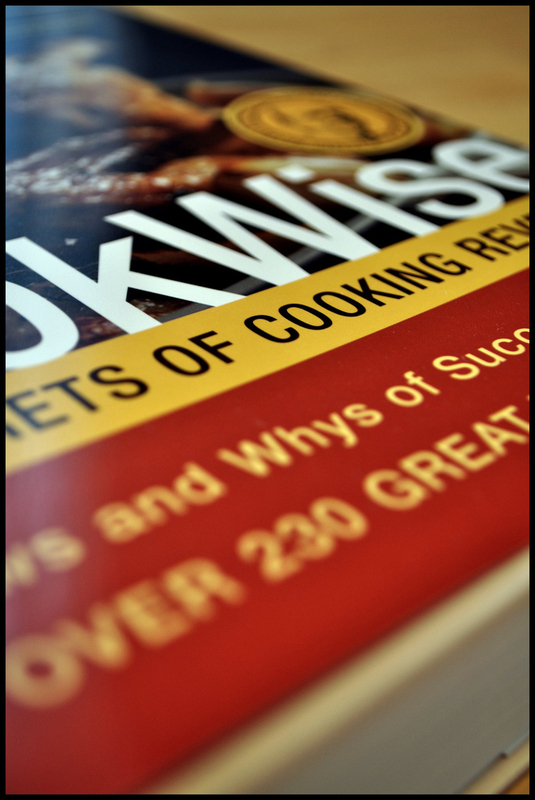 Want to win my copy of Cookwise? Just leave me a comment below with the one thing at the top of your holiday gift list this year. One commenter will be chosen via Random.org at noon on December 20th to receive an little extra holiday cheer. The give away is open to residents of the US and Canada and the book will ship via USPS Media Mail. My thanks to the Red Hot Chili Peppers for providing the soundtrack to my high school and college years as well as the title of this post. Anthony and the boys are in no way associated with this bloggyness or any giveaway activity. I’m a science nerd. I could get down with that book. I think. And, any post with a Red Hot Chili Peppers reference gets me out o’ the woodwork. At the top of my holiday list is a Le Cruset dutch oven. It’ll probably remain there, as we’re doing a low-budg Christmas this year. Maybe next year, though! At the top of my Christmas list this year is a Lodge Enameled Cast-Iron dutch oven. Anyway, enough mushy gushy–at the very top of my XMas list is a 50mm f/1.8 lens for my dear little Nikon. Though if Santa is EXTRA generous he could send me the 50mm f/1.4 lens instead (not crossing my fingers though). A sewing machine. Or yarn. But cookbooks are always nice too! Wendi, I’m impressed you read the whole book even though it wasn’t resonating with you. And I’d love to get a thermometer this year. That’s so random. I’ve been wanting to read Cookwise and Bakewise ever since Shirley paid a visit to my culinary school around 6 months ago. She was so amazingly sweet and told a hilarious story about deep frying random crap on the Jimmy Kimmel Show with Snoop Dog. And she made us amazing biscuits. I never get around to buying her books because I have around 10 other similar books I’m also supposed to read sitting on the shelves. This year I would like a Le Cruset 1 quart cherry gratin dish. Not that I’m picky or anything. I spied a beautiful set of Pyrex bowls on Etsy, and I think I may have bribed my mom into getting them for me. @Jenna, I love your comment about the Smashing Pumpkins!